Every Christian is called to be a world changer, but no Christian can change the world on their own! The Great Commission is about partnership, a partnership in which the Body of Christ has a vital place. Cleon J. Alleyne was born in Georgetown, Guyana to Claude and Eileen Alleyne in 1974. He was raised by his mother, Eileen, in Stanleytown on the West Bank of Demerara in Guyana. Although he grew up in a Christian home, he later began to recognize that he did not have a relationship with God. In 1988, he gave his life to Christ. Missionary Alleyne has over 22 years of ministry experience. He began working for Christ in his late teenage years when he accepted the responsibility to help pastor a young church. He was studying for school, working part-time, and helping pastor a small church in Pouderoyen, Guyana. 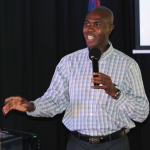 In 1993, Missionary Alleyne began working in missions part-time with Youth With A Mission (YWAM) Guyana. In 1995, he joined YWAM Guyana as a full-time staff member. During this time, he spent much time ministering to the indigenous Akawaio people in the remote, country lands. While with YWAM, his desire to preach the Gospel grew. This desire began to form a passion inside of him to reach those that had never heard the Gospel. In 1998, Missionary Alleyne fulfilled this calling by leaving Guyana to reach the “lost” in Korce, Albania. At the same time, his mother was sick with cancer. Although it was difficult to leave her, he knew that he heard the voice of God telling him to leave. Many people did not agree with his decision, but he knew that if he obeyed the Lord then the Lord would take care of the rest. In 1999, an article was published in Guyana about the work that Missionary Alleyne was doing and how he was the only Guyanese in Albania making a difference in a war zone country. His family began to understand that it was, indeed, the Lord’s plan, and his mother was healed of cancer that same year. Months prior to Missionary Alleyne’s arrival in Albania, there was a civil war in Albania. There was armed rebellion against the government due to financial corruption that cause many people to suffer. After the United Nations intervened, some order was restored. Missionary Alleyne states that in Albania there is still a spirit of tyranny and division and the damaging mental and social effects of poverty are still present. He is currently serving with YWAM Albania, in the city of Durres, He states that he is happy that the Lord called him to Albania; and he feels blessed to have served there for 18 years. On October 26th, 2013, Missionary Alleyne’s mom passed away and on October 26th, 2014, He was ordain as a Missionary Pastor. Missionary Alleyne has yielded his life to the Lord, and the Lord has continued to sustain him in his calling and ministry life.